Celebrate Calgary’s 16th Annual Breaking Bread Fundraising Dinner!! Doors open 5:30pm. Join us – Come early for visiting and shopping at our Afghan Marketplace. The program and dinner will begin at 6:15 pm. TICKETS: The ticket price of $125.00 includes $50.00 for the meal and a $75.00 tax receipted donation. Select 1 or more QUANTITY to purchase the tickets you wish to pay for and complete the attendee information for you and your guests. IMPORTANT: The total tax receipt included in your ticket of $75.00 will be issued directly by CanadaHelps at the time of purchase to the person who purchases the tickets, not to attendees. GROUP SEATING: Selection 1 QUANTITY to purchase your single ticket. Then, “just like going to a restaurant”, make a group reservation. Provide one first and last name as a reservation group name in the box provided. When your friends and guests purchase their tickets, they must register using the identical first and last name for the reservation group name to ensure they are seated together with you. TABLE OF EIGHT: Select 8 QUANTITY at $1,000 to purchase a full table for your guest and complete attendee information and reservation group name at checkout. The $600 tax receipt will be issued directly to you by CanadaHelps at the time of purchase. Thank you for being a valuable part of our support network. We could not do this without you! Have Fun. SPECIAL FOOD REQUIREMENTS? We will have a vegetarian or gluten-free option available. Please enter your requirements in the box provided. STUDENT TICKET $35.00: Select 1 or more QUANTITY to order student tickets at a reduced rate with no charitable donation. CW4WAfghan is subsidizing the tickets to encourage students to participate. THANK YOU to our generous event sponsor TERVITA, and our in-kind sponsors, Willow Park Wines and Spirits, Greengate Garden Centres and Digicopy Imaging. Deborah Yedlin, Chancellor UCalgary 2018-2022, is a longtime business commentator and community volunteer. She co-chaired the 2016 United Way Campaign and has been on the boards of several arts and community organizations, including the Calgary Philharmonic Orchestra, Calgary Opera, YMCA Calgary and WinSport. Deborah Yedlin graduated from the University of Alberta in 1984 with a bachelor of arts in economics and English. She also has an MBA from Queen’s University. Dr. Lauryn Oates, CW4WAfghan Executive Director, is an award winning human rights activist focusing is on international development, women’s rights and education in conflict zones. She has worked with diverse organizations and agencies throughout the Muslim world on gender and human rights advocating for women’s rights, particularly in Afghanistan. She has been contracted as an expert consultant with the United Nations Children’s Fund (UNICEF), the Nike Foundation, USAID, Global Rights, Medica Mondiale, Womankind Worldwide, and Transparency International, among others. She holds a PhD in language and literacy education from the University of British Columbia. Become a Member. Simply SIGN UP to demonstrate your support as a global citizen who values universal human rights. Donate: If you cannot attend and would like to make a donation, all amounts of donations are warmly welcomed and greatly appreciated! Online donations may be made via credit card above and at www.CanadaHelps.org. Host A Breaking Bread Dinner. Breaking Bread for Women in Afghanistan is a volunteer initiative to raise funds for education programs for Afghan women and girls. The large majority of our donations come from individual donors with ongoing support from all of our chapter members and volunteers. Breaking Bread events can be organized in all kinds of ways, from a simple potluck meal among friends in your home to larger events in the community, such as in a church hall, community centre, school, or other venue. Please click here Breaking Bread, call 1 403 244-5625 or email Community@CW4WAfghan.ca for further information. 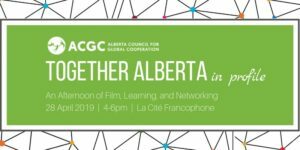 The Alberta Council for Global Cooperation invites you to an afternoon of film, learning and networking as we launch a series of videos exploring how everyday Albertans are working towards the United Nations Sustainable Development Goals (SDGs). Together Alberta: In Profile is a series of short videos created by ACGC exploring the various ways Albertans contribute to the Sustainable Devleopment Goals. From human rights to human health, watershed protection to poverty reduction, get to know unique Albertans from diverse walks of life that are making a difference at home and abroad. Networking will follow the screening and panel discussion. Refreshments will be served; a cash bar will be available. Scott Parker is an Edmonton filmmaker and editor with extensive experience in community-engaged filmmaking. Scott has won numerous awards and nominations for his work, and is grateful for the opportunity to showcase how Albertans are making progress on the SDGs. When Scott’s not filming or editing, he is working on sustainable tourism projects with remote communities in Botswana. This event is part of ACGC’s Together Alberta initaitive, aimed at raising awareness and mobilizing action on the UN Sustainable Development Goals in Alberta. This event has been made possible through a grant from the Government of Alberta, Community Initiaitves Program, and the Government of Canada’s SDG Unit, Employment and Social Development Canada.